Et pour prouver que vous n'êtes pas un robot : 9 plus 7 = ? Rolf Julius Weinberg alias Henri Rovey - son Livre d'or ! Rolf Weinberg est mon ami depuis bien des années. C'est un homme a qui la France reconnaissante a offert la nationalité française pour services rendus au Pays et a la cause de la Liberté pendant le Deuxième Conflit Mondial. Persecuted victims promised revenge ROLF WEINBERG was born in Westphalia, Germany, in 1919, but escaped to Uruguay after his father bribed a local official in 1938. As the ship carrying him into exile sailed out of Hamburg, Mr Weinberg swore on a copy of the Old Testament that he would revenge himself on his persecutors. After the war, in which he was the highest-ranking German officer in the Free French, he was awarded the Légion d’honneur and the Médaille Militaire. He also received a personal letter of thanks from President de Gaulle. " IT is almost impossible to imagine the pain Mina and Zeigmund Reich must have suffered when faced with a heartbreaking dilemma – send your three sons, all aged under 10, to a country they have never visited before, or let them stay in Poland as the Nazis threatened invasion. When the couple said their goodbyes in 1939, the decision would save their children’s lives, but they would never see them again. The story of the Reich family was just one of many painful memories recalled at Belsize Synagogue, in Belsize Gardens, on Thursday, the annual Holocaust Memorial Day. Now in his late 60s, Erich Reich, a charity tour organiser based in Highgate, barely remembers the day when as a four-year-old he travelled by boat from a Polish port, across the Baltic sea to land in the East End, where his brothers Ossie and Jacques had gone before him. He reached London on August 29, 1939, to be met by workers for the Jewish Free School. His parents, originally from Vienna, were trapped in the Warsaw ghetto and their children were to hear only one piece of news from then again, via an uncle who received a letter through the Red Cross. It said they were in Auschwitz, where they were to become two more victims of the Nazi genocide. He was taken to Dorking in Surrey, where the Duke of Newcastle had given over Burchett House for the care of refugees. There were six children and 10 families living there, and one non-Jewish family. They took him in. His adopted mother and father were a Mr and Mrs Kreibicht, socialists from the Sudentenland who had fled when it was annexed by Germany. “I did not know they were not my mum and dad,” he recalled. His new family took him to Sunday School and church, but his Jewish identity was reaffirmed when he was 10 years old. Erich led the stranger inside – and it turned out he was Jacques, his older brother. 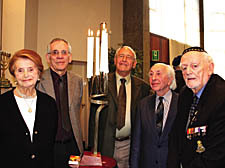 Others at the synagogue event included Rolf Weinberg, the highest decorated Jewish officer in General Charles de Gaulle’s Free French Army. He had fled his home in Westphalia to head for South America in 1938, and then came to Britain in 1941 and fought under de Gaulle’s command. The synagogue was established by refugees from Germany and Austria in 1938 – and many of them still visit regularly. Rabbi Rodney Mariner said: “Many of the people here are members of the Association of Jewish Refugees, and there are some survivors of the camps. “The importance of the Memorial Day is to remember the past and hope we learn for the future.” "
« Cher M. Bernard COCHERY, consul général de France, cher amiral Jacques LAUNAY, attaché de Défense auprès de l’ambassade de France, chère Mme LAMBERT, officier de l’état civil, Mesdames, Messieurs, chers camarades et amis. Profondément ému, il m’est difficile de trouver les mots qui pourraient exprimer ce que je ressens en ce moment. Cela fait aujourd’hui 65 ans et quelques jours que je suis arrivé à Londres, venant d’Afrique du Sud pour rallier les Forces Françaises Libres. Quand, en 1938, j’ai pu échapper des mains de la Gestapo en Allemagne, j’ai juré la main sur la Bible empaquetée d’urgence par ma mère dans ma valise, que j’emploierai ma vie à combattre les nazis et tout autre organisme antisémite ou antiraciste. Je n’ai jamais failli à ce serment. A mon arrivée à Londres, le général DE GAULLE m’a fait convoquer à son quartier général, voulant connaître ce jeune homme qui venait de si loin pour se joindre aux Forces Françaises Libres. Ma réponse a dû certainement lui plaire car il m’a serré la main en disant « Bienvenue aux F.F.L... » Il a donné au professeur CASSIN l’ordre de m’envoyer au camp d’entraînement de Camberley, en insistant pour que je reste à ses ordres, compte tenu de ma connaissance de nombreuses langues que je pouvais parler et comprendre, dont l’allemand, ainsi que des informations que je pouvais lui donner concernant les brutalités de la Gestapo. Après une mission accomplie au Liban, j’ai été incorporé à la première D.F.L. de la France Libre à El-Alamein. Après la bataille contre la ligne Mareth en Tunisie, j’ai obtenu une permission de quatorze jours pour rendre visite à ma famille à Tel-Aviv. De retour à la division, le général Diego BROSSET, sur ordre du général DE GAULLE, m’a convoqué au QG 50. Après un long entretien en espagnol, langue que nous parlions tous les deux couramment, il m’a informé que j’étais muté au premier DCR, QG 50, une unité considérée comme unité d’élite. Je me suis trouvé là avec le souslieutenant Pierre PASQUINI. Je pense que rarement pendant cette guerre on n’a pu trouver des êtres aussi humains que Diego BROSSET et Pierre PASQUINI. J’ai pleuré comme un enfant lorsque le général BROSSET est mort pour la libération de la France. Après la guerre, je suis resté en contact avec Pierre PASQUINI et nous sommes devenus de bons amis. Il a joué, à un moment donné, un rôle important dans ma vie. La perte de ces deux hommes, Diego BROSSET, qui n’avait que 46 ans et Pierre PASQUINI, décédé le 1er mars 2006, a été très douloureuse pour ceux qui les ont connus et se sont battus à leurs côtés. Nous n’oublierons jamais nos camarades qui ont donné leur vie pour libérer la France de ses occupants méprisables et criminels. C’est donc pour moi, aujourd’hui, la fin d’un parcours volontaire, d’une épopée mémorable et sensationnelle, à laquelle j’ai eu la chance de survivre et dont je ne regrette rien. » "
Le vrai nom de Henri Rovey est Rolf WEINBERG . A photograph of Rolf Weinberg shows him in his Free French officer's uniform, looking every inch the part of a noble warrior. The photo is reproduced in a finely illustrated paperback book detailing parts of Rolf's life which appeared earlier this year. 'Much of his story is left untold', Rabbi Rodney Mariner comments in a preface. Quite so. A conversation with Rolf about his past entails numerous pauses, while Rolf considers what he may reveal - even after so much time has gone by - about his involvement in not one but two fascinating careers - as an officer in the Free French Forces and as a man keen to help lay the foundation of the Jewish State. Rolf Weinberg was born in the Westphalian city of Herford in 1919. His father was the director of the family's chocolate manufacturing business. On the day following Hitler's accession to power, Rolf and his sister were attacked by pupils at their gymnasium, while most teachers looked on laughing. Their parents removed them from the school without hesitation. Rolf became an apprentice in a textile shop owned by a Jewish family. Here he gained experience in office administration and hated every minute of it. In 1936 Rolf's mother took him to a knitting machine factory in Stuttgart where he became an apprentice. He began a course in textile engineering at a technical college in Reutlingen and, in September 1938, having received his engineering diploma, he moved to Hamburg following a tip-off that he was to be arrested by the Gestapo. That same month, the 19-year-old Rolf left for Uruguay, one of the few destinations then open to Jews fleeing Nazi Germany. Sailing out of German territorial waters, Rolf swore he would devote his life to helping to destroy the Nazi regime as well as to fighting antisemitism. At the onset of the Second World War Rolf presented himself as a volunteer to both the British and French embassies, but was turned down. In the Battle of the River Plate in December 1939, the German battle cruiser Graf Spee entered the port of Montevideo for repairs. At three in the morning Rolf was sent for by the British ambassador and asked to undertake a mission to help the war effort by spreading disinformation among the crew of the Graf Spee. Days after the fall of France, Rolf presented himself once again at the French embassy. On this occasion, he was accepted for the London-based Free French Forces of General Charles de Gaulle. In April 1941 he met for the first time the French leader, who, not surprisingly, was curious as to why this young Jew born in Germany was so keen to fight for France. 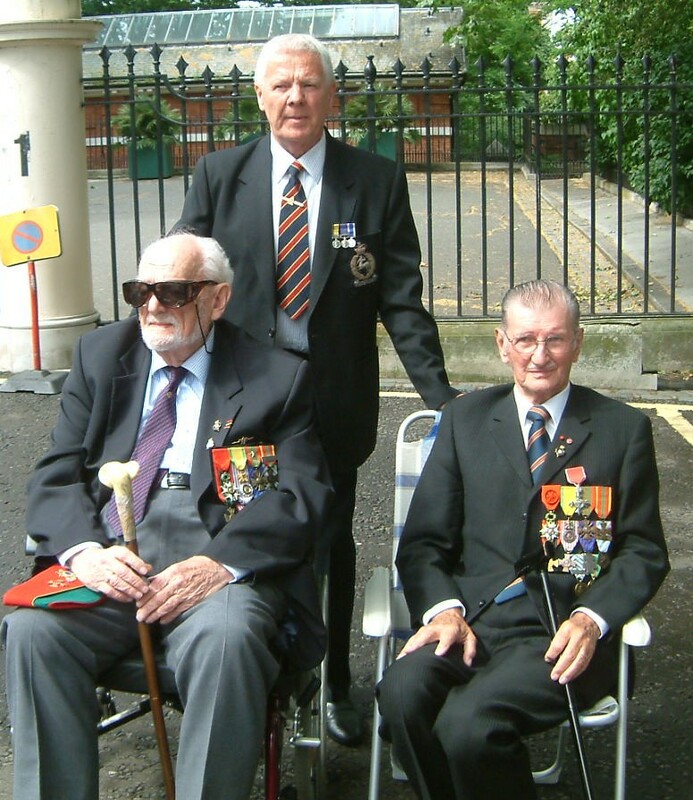 Rolf spent 1941 at Camberley Free French camp where he underwent tough military training. He left the camp bearing the rank of Second Lieutenant. In December that year he was sent on a mission to Lebanon to investigate arrested German officers attempting to penetrate the Free French Forces. Rolf Weinberg ceased to exist: 'Henri Rovey' arose in his place. In July 1942 'Henri Rovey' finally became a member of the 1st Free French Division, commanded by General Koenig, who after the war was promoted to the rank of Maréchal de France and became President of the Christian Jewish Association of France. The division was attached to the 8th Army fighting from El Alamein to Tunis under Field Marshal Montgomery. Now to the second strand of Rolf's unique military career. In July 1943 he was one of 17 NCOs who transported arms captured from the Afrika Corps to the Haganah. Arriving in Rehovot, the men were blindfolded and taken to meet Moshe Dayan. Rolf's links with Israel's military leaders have lasted right up to the present day. Also in July 1943 Rolf was appointed Major in the Free French Forces. In 1943-44 he fought on the front line in a number of battles. In 1944 Rolf played his part in the liberation of southern France, his mission being to contact resistance forces. With a half-smile, Rolf says that General de Gaulle gave orders at the time that the details of another important mission were not to be revealed until 2045. Rolf was decorated many times for outstanding battle service and awarded the Médaille Militaire - France's equivalent of the Victoria Cross. After the war Rolf rejoined his parents in Montevideo. In 1954 he returned to Germany for four years, working in the sphere of pre-fabricated housing. In 1968 he left with his wife Sarah for Spain, where she opened a pair of men's fashion boutiques. In Spain, Rolf says matter-of-factly, he was twice the target of Palestinian gunmen. On the second occasion, a man seated at a neighbouring table in a café was shot in his place. Sarah died in 1988. In 1990 Rolf came to London to join Ruth, the partner of his youth. He became a member of the AJR, living for five years in a flat at the association's Cleve Road Day Centre, and of Belsize Square Synagogue. One day perhaps, Rolf Weinberg's full story - without pauses - will be told. "